The Jets have rescinded their offer to free agent defensive tackle Ndamukong Suh, owner Christopher Johnson told reporters, including Ralph Vacchiano of SNY (Twitter link). 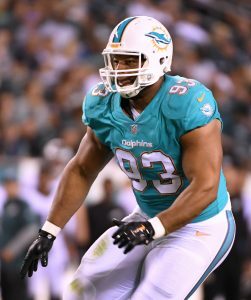 New York was believed to have had the largest offer out to Suh. Gang Green was a late entrant into the Suh sweepstakes, as the veteran defender was though to have narrowed his potential destinations to the Rams, Saints, and Titans. The Jets had the most cap space of any of the teams involved in the bidding, but Johnson said adding Suh “wasn’t in keeping with [the Jets’] long-term plans,” tweets Vacchiano. Suh is now 31 years old, but he’s still a dominant player: he managed 20.5 pressures and and 4.5 sacks from his defensive tackle position while grading as the NFL’s No. 5 interior defender in 2017, per Pro Football Focus. He’s also incredibly durable, as he hasn’t missed a single contest since 2012. Last season, Suh played a whopping 883 snaps, the second-most of any defensive tackle in the league. While the Jets were reportedly willing to offer Suh the most money, he was never certain to simply follow the dollars. The Rams, Saints, and Titans each made the postseason in 2017, while New York is still embarking on a rebuild, so Suh may forgo the largest contract offered in order to sign with a contender. If he had signed with the Jets, Suh would have likely lined up as a 3-4 defensive end opposite Leonard Williams. If New York is still searching for more affordable options along its line, the club could hypothetically look at other free agents such as Alan Branch, Karl Klug, or Quinton Dial. Then why did he not accept the jets offer? Are you dumb? So Rams it is then huh? Seems like the rams will be his destination. Suh and Donald is scary good inside. Donald is going to be paid a ridiculous amount of money. No room for Suh. Too slow to the draw on this ‘go-around’ though …. Jets should not have offered that money anyway. Too many other holes and winning two more games is not helping. Rebuild through the draft,then spend the money. Titans can offer most money now. He’s going to Nashville. Come to Cleveland. Finish the building of a dominant defensive line. Eh, the Jets do need one more really talented guy on the D-line but we did just get rid of M. Wilkerson and S. Richardson for their attitude problems. Maybe not signing him was the best move for the Jets? ^^^ This, times 100. The Jets need many things. Defensive line help and possible malcontents in the locker room are absolutely not among the things the Jets need. As if it were likely to happen even if they left it on the table. I rescind my date request to Jennifer Lawrence, you know I’m just not that into her anymore. Sorry Jen. Hopefully, she can overcome the devastation of not having dinner at Burger King. Wade Phillips is clearly one of the best DCs in the league but I have to wonder if he would want to deal with the two massive egos that Donald and Suh have. Could those two co-exist peacefully? Jets may have just engineered the best “non signing” of free agency. Time will tell.